In the fall of 1961, a small group of men living on the second floor of Ball State Teacher College’s historic Elliott Hall developed friendships that eventually led to a loosely organized group named Goovna. 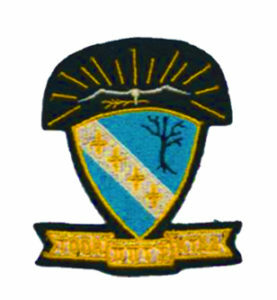 The Goovnas organized into a recognized campus organization on December 12, 1963. On December 17, 1964, the group was recognized as Pi Delta Gamma. 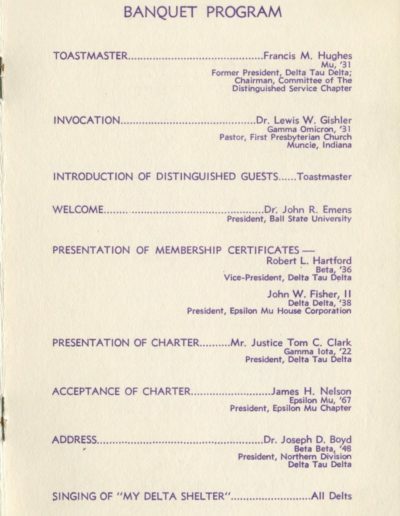 In April 1965 the local Pi Delta Gamma fraternity became a colony of Delta Tau Delta and on November 12, 1966, the induction ceremony of the Epsilon Mu Chapter of Delta Tau Delta International Fraternity took place at the L.A. Pittenger Student Center on the Ball State University campus. 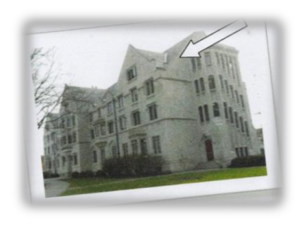 To solidify its fraternity status, the Delts took possession of a house at 1201 W. Riverside Drive on January 1, 1968. The Delt Shelter was occupied by its brothers on January 15. With Elliott Hall being the smallest men’s dormitory on campus, the environment lent itself to a feeling of unity among its residents. For one group, this unity moved from friendship to bonding and eventual brotherhood. This particular group of men often visited each other’s homes on week-ends in Hagerstown, Elkhart, Hamlet, Kokomo, Indianapolis, and Seymour, Indiana and North College Hill, Ohio. On other weekends they took road trips to Greenville, Ohio and Miami University in Oxford, Ohio. Over time, these men became more organized and participated in intramural sports and various student organizations including student government. As these men became more organized, they determined that they needed an identity. Possible names discussed included “Tappa Kegga Dayski” and “Sigma Phi Nothing,” but neither was deemed suitable. Elliott Hall resident member Randy Ziolkowski then suggested the name “Goovna” and the group approved. The Goovnas were extremely active in the government and operation of Elliott Hall with the desk’s staff and the hall’s government heavily populated by its members. From 1961 through 1963, additional residents of Elliott Hall joined the Goovnas. At the same time others departed and associated with established fraternities and other campus organizations. Those men who associated with Goovna, especially after the 1962-1963 school year, became a group of committed men: in-sync and bonded. During the summer of 1963, the Goovnas gathered for a party at Brother Louis Abraham’s parents cottage on a private lake near Seymour, Indiana. It was at this party that the men realized the brotherhood that they had established extended beyond their particular interest in intramural sports or hall government. They determined to participate in additional campus activities including a campus champion intramural bowling team, a theatrical spoof of “Snow White and the Seven Dwarfs” at the campus talent show, the campus bike-a-thon, freshman camp, and memberships in other student organizations. With increased interest in campus memberships and activities, a place to meet became a priority. A small, cramped, attic storage room on the fourth floor of Elliott Hall was secured. The room was used to store old dormitory furniture and fixtures. It had a sloping ceiling because of its location under the eaves of the roof. To decorate the small area, hundreds of unwrapped cigarette packages were stapled to the slopping walls. The wall became an array of color as the Goovnas smoked a variety of brands. No one brand seemed to be favored. And yes, the room was usually smoke- filled as smoking was both widespread and accepted at the time. In fact, cigarette manufactures often provided promotional sample packs as students entered the Elliott Hall cafeteria. Once the Goovnas secured a meeting place, a number of questions needed to be answered. Is the group content to be a short-lived intramural sports group? Do the Goovnas become a recognized campus group? If organized, what steps need to be taken? After the Goovnas decided to organize, it was in this windowless, smoked-filled attic storage room that the group’s Constitution and by-laws for Goovna (and eventually Pi Delta Gamma) were composed. Countless hours were spent in the attic working toward recognized campus organization status. Finally, on November 4, 1963 the Goovnas adopted its Constitution and elected its first and only officers. The Goovna officers were Jerry Brelege (Batesville), President; Dennis Hockney (North College Hill, Ohio), Vice President; Tom Seffrin (Hagerstown), Secretary; and Jeff Snyder (Indianapolis), Treasurer. On December 12, 1963 the Ball State Senate approved the Goovna Constitution recognizing the group as an official campus organization. Guio (Indianapolis), and Louis Robin Russell (Ft. Wayne) were among its members. Given the Fratry’s wish to move more quickly toward recognized organization status, a meeting was scheduled between the members of the two groups. After several meetings, formal invitations were sent to Fratry members to become members of the Goovnas. 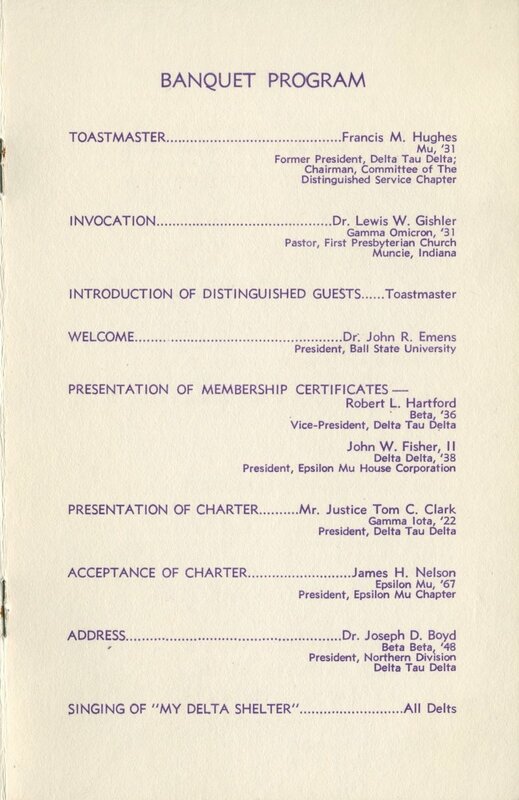 On January 27, 1964, Fratry members who accepted the invitation became active Goovnas. To further signal its intention to earn fraternity status, Goovnas voted to change its name to Pi Delta Gamma. 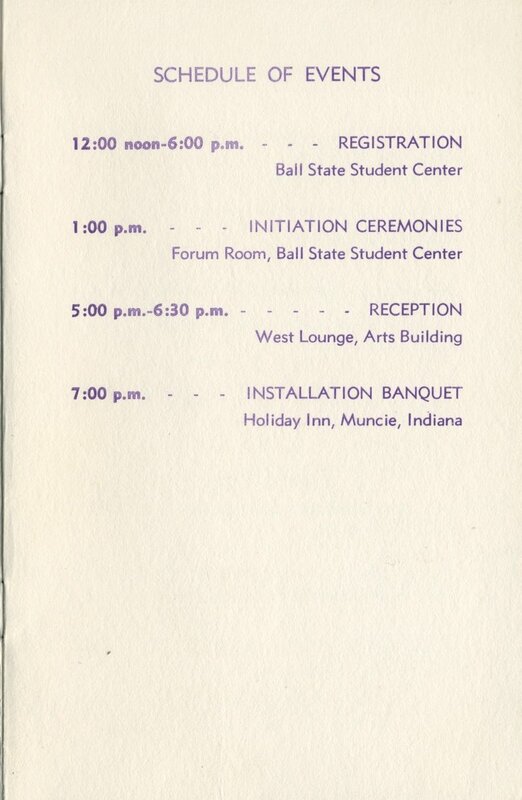 The change became official upon approval of the Ball State Senate on February 12, 1964. This also brought about a new set of officers. 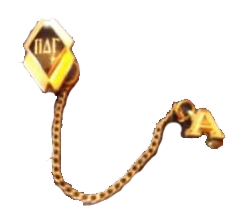 Elected as Pi Delta Gamma’s first officers were Dennis Hockney, President; Gary Turner (Indianapolis), Vice President; Jeff Snyder, Secretary; and Tom Seffrin, Treasurer. Weekly dues were set at 25¢. With a goal of being recognized as a local fraternity, the group requested and the Inter- fraternity Council assigned an advisor – Lambda Chi Alpha active Jim Garrison. Garrison suggested that the group conduct itself as much like a fraternity as possible. 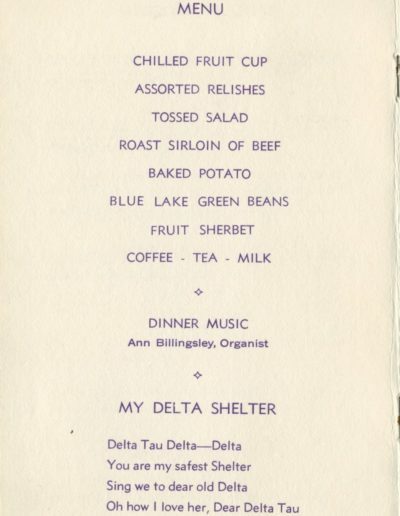 With this guidance, members of Pi Delta Gamma scheduled weekly meetings held in the Arts Building, established dues at $10.00 per month, and on April 17, 1964 entertained the women of Sigma Sigma Sigma at its first sorority trade party. On May 11, 1964, the official crest of Pi Delta Gamma, which was crafted by Ron Lancioni . 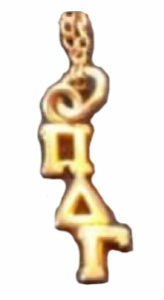 The crest, which reflected the Pi Delta Gamma ritual, was approved by the membership. At the top of the crest were thirteen golden rays reflecting thirteen Greek letters with a dove carrying an olive branch below the rays. A tree in the upper right segment of the crest represented the poem, Trees, written by Alfred Joyce Kilmer that celebrated the common beauty of the natural world. At the base of the crest were Greek letters depicting the initials of the Pi Delta Gamma motto: (Thy Duty to Think and Act for the Benefit of Man). It was upon this motto that the brotherhood of Pi Delta Gamma was founded. During late summer of 1964, the brothers gathered at the home of Lyle Thompson near Sheridan, Indiana to socialize, and more importantly, to develop strategy to become a campus-recognized local fraternity. 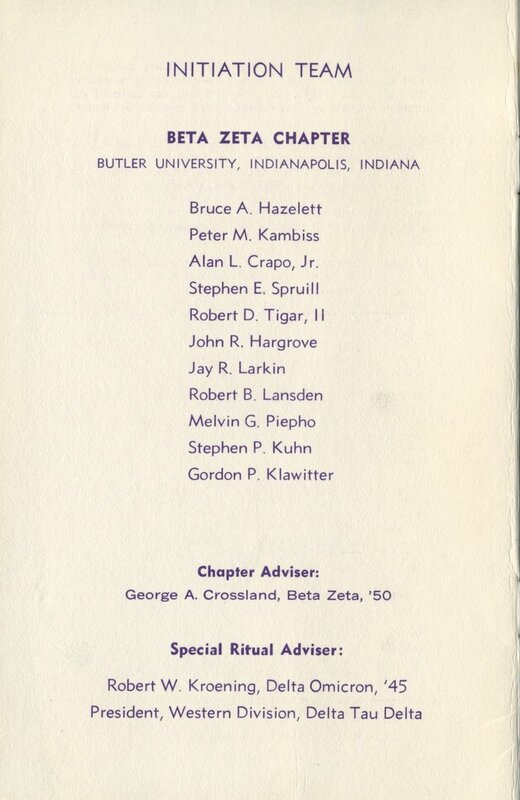 Upon returning to campus for the 1964-1965 academic year, the men asked Dr. Margaret Kneupple, Ball State Director of Professional Selection, to become Pi Delta Gamma’s sponsor. She agreed on October 15, 1964. Also, during the fall of 1964 the men of Pi Delta Gamma built its first homecoming parade float, and were actively engaged in numerous aspects of campus activities. On December 17, 1964, the men were rewarded for their continuous efforts when fraternity status was conferred by the Inter-fraternity Council. In addition, new officers of Pi Delta Gamma were elected. They were Tom Murray, President; Louis Robin Russell, Vice President; Carl St. Myer (Winchester), Secretary; and Dan Hockney (North College Hill, Ohio), Treasurer. This election of officers signaled a genuine brotherhood between former Goovna and Fratry members; the two indeed became one. Murray and Russell were original Fratry members and St. Myer and Hockney were original Goovna members. Once Pi Delta Gamma was recognized as a local fraternity, it participated in the formal campus rush program. In January 1965, the Pi Delts held its first smoker. Rush parties and coffee hours followed until February 5 when Pi Delta Gamma received its first pledge class of eight men. Pledges were Jim Nelson, Thomas Borshoff, Michael Cress, Joseph Erne, Brad Wagnon, Mark Burkhart, Jim Johnson, and Fred Strantz. Delta International Fraternity. 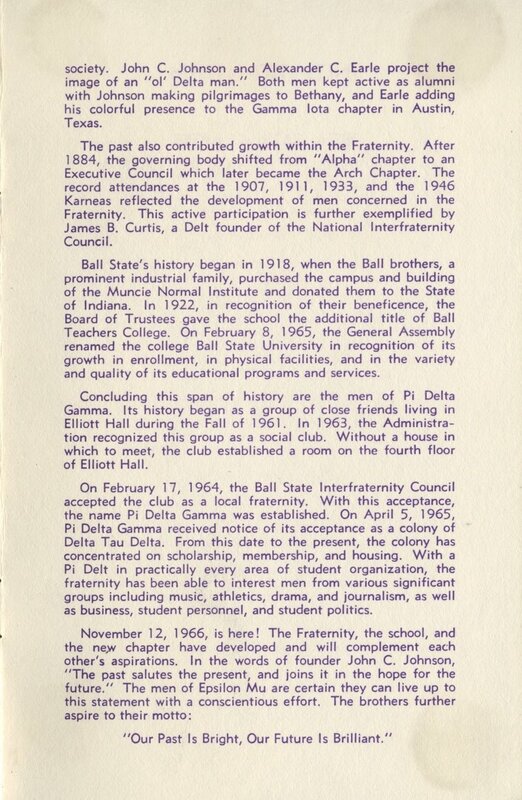 Shortly thereafter, on April 5, 1965, the men of Pi Delta Gamma were granted official colony status with Delta Tau Delta. At the next business meeting the men celebrated both its new affiliation and its second-place “All Greek Variety Show” trophy. The men were confident this international fraternity affiliation and its variety show performance were its notice to the Ball State campus that a new group of men was ready to become a positive and powerful campus force. After colony status was established, the National Delta Tau Delta office assigned Mr. Darryl Moore as the colony’s National representative. He visited the chapter on several occasions and kept the long-term goal of installation of Delta Tau Delta EM as the colony’s foremost objective. Another gentleman, Mr. John W. Fisher, also kept a watchful eye on this new colony. Fisher was a past president of the Delt Tau Delta chapter at the University of Tennessee in 1938. He was also a distinguished member of the National field staff and the CEO of Ball Corporation in Muncie. In addition to Mr. Moore’s guidance, Mr. Fisher invited several Delta Tau Delta Colony members to his home to discuss its future, including the need for a shelter. In addition to Messrs. Moore and Fisher, a Muncie banker and alumnus of the Beta Zeta chapter, Mr. Walter Klinge, was also a catalyst in bringing the Delta Tau Delta Chapter to the Ball State campus. Along with meetings at Mr. Fisher’s home, other meetings were held at Mr. Klinge’s home. Because of his assistance, he was appointed the first chapter advisor at the time of the installation. 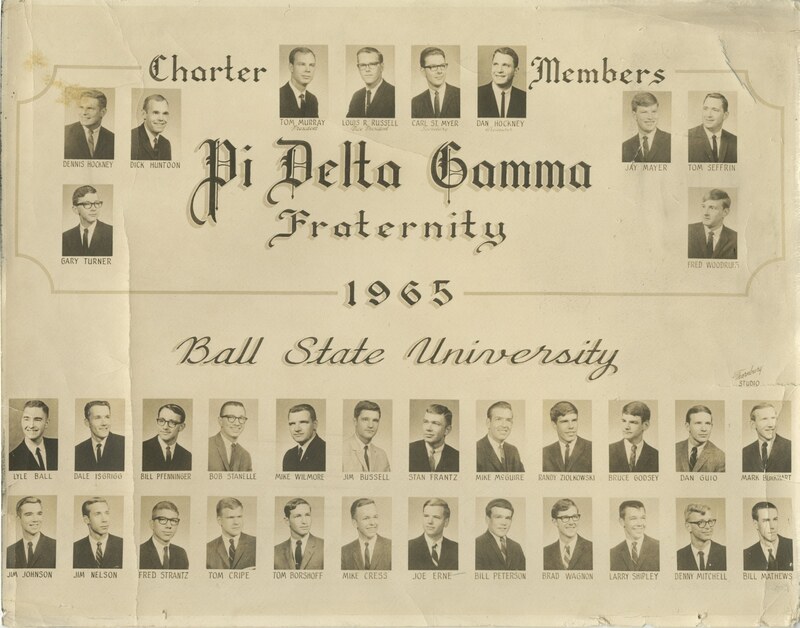 In early May 1965 the first Pi Delta Gamma pledge class was activated, just in time for the fraternity’s inaugural closed dance which was held in the ballroom of the historic Hotel Severin in downtown Indianapolis. The theme of the dance was commemorated with favors, a leather encased deck of cards. 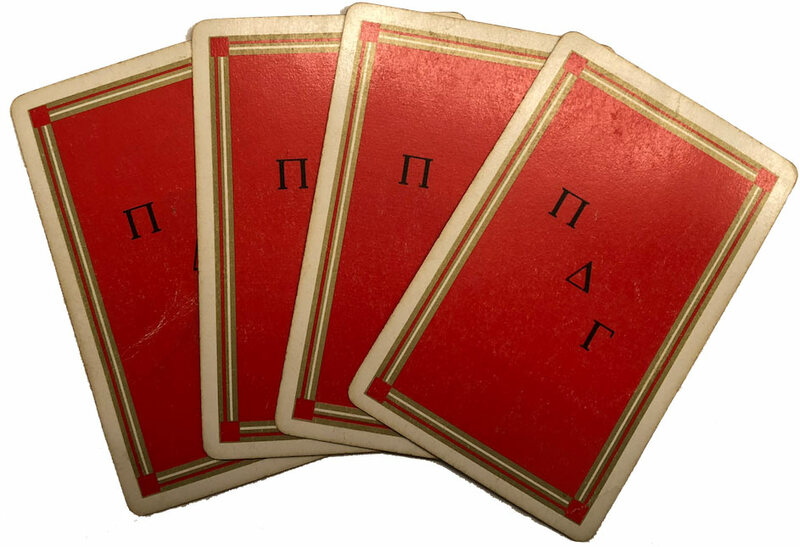 The case was embossed with “ΠΔΓ” and the words, “We’ve Been Delt With.” The decks of cards were stamped with the letters “ΠΔΓ”. 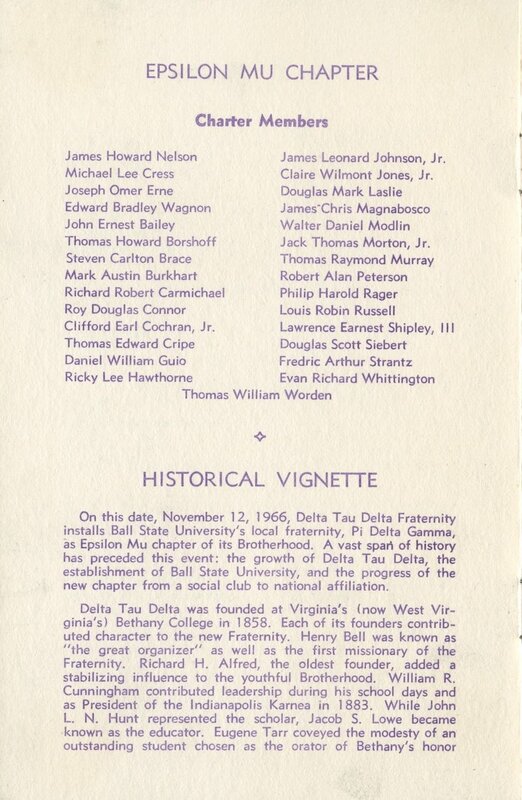 The men of Pi Delta Gamma returned to Lyle Thompson’s home during the summer of 1965. Again, the men gathered to enjoy time off from studies and appreciate their brotherhood. The time spent included in depth discussion in planning for the new school year as evidenced in the picture below (Louie Russell – in BSU t-shirt, Unknown next to Louie, Tom Borshoff – seated with hat, Bill Bussell – standing in dark t-shirt, Tom Murray – far right, and Lyle Thompson – bottom right). 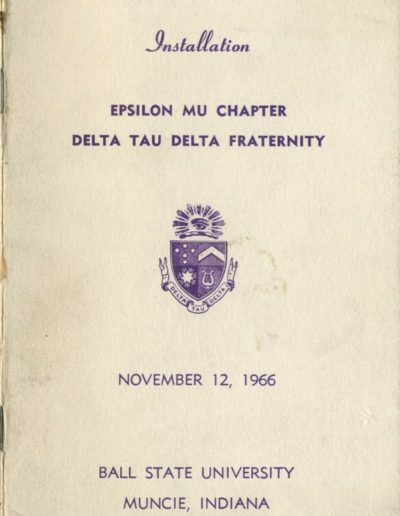 In the fall of 1965 and spring of 1966, prospective members were invited to attend numerous Pi Delt sponsored events including coffee hours, homecoming float work sessions, smokers, informal gatherings, and a “funeral party.” These events produced two very strong pledge classes, and with these new classes, the men rededicated themselves to become even more active in campus activities. 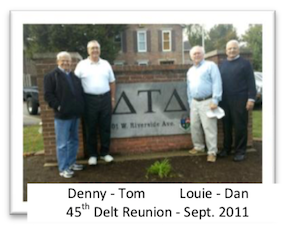 The summer of 1966 brought the Pi Delt men to Indianapolis for a dance and party at the home of Dave Toth. 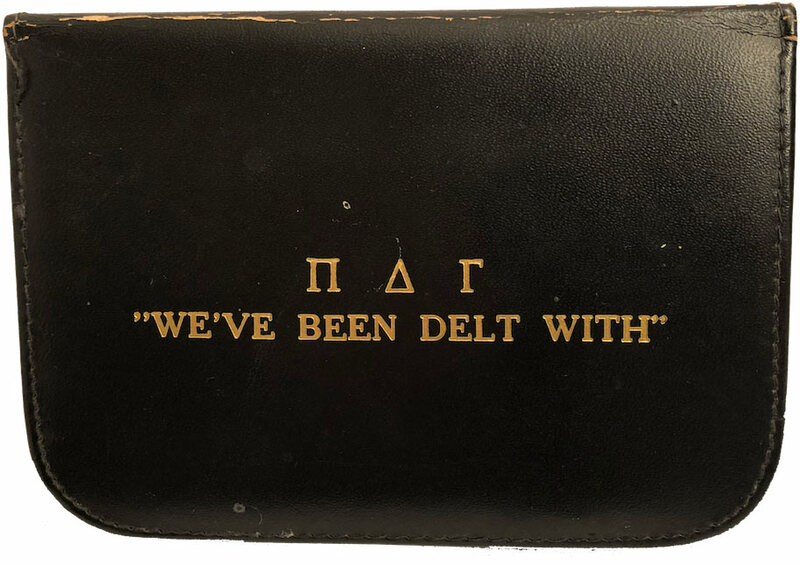 Enthusiasm was high because the men were sure that the new school year would see Pi Delta Gamma change its name to Delta Tau Delta. In late September 1966, the long-awaited news arrived. 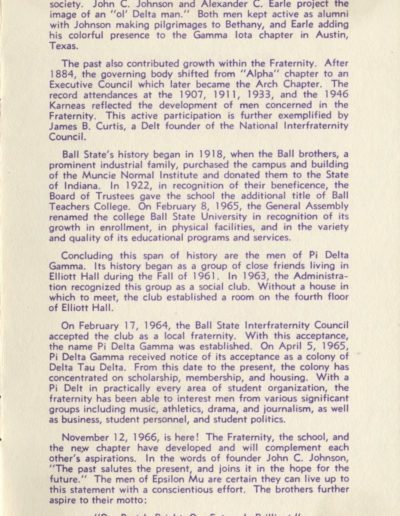 Pi Delta Gamma President Jim Nelson (Columbia City) and Vice President Joe Erne (Batesville) announced that November 12, 1966, would be the date on which the Epsilon Mu chapter of Delta Tau Delta would be installed at Ball State University. Hundreds of details had to be completed prior to the formal installation, reception, and banquet. 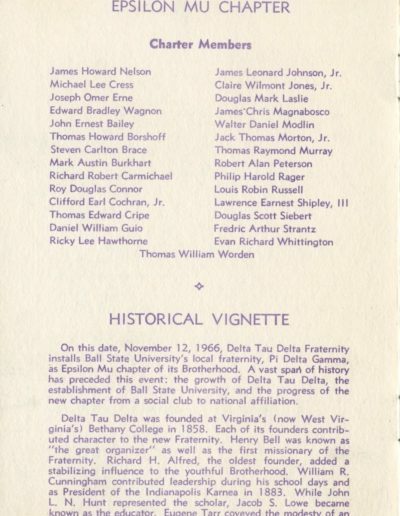 All the details came together and November 12, 1966, was a tremendous day in the lives of 36 Ball State men who on that day were transformed from a Pi Delt to a Delt. Delts from all parts of the United States gathered to witness the installation of the 94th chapter of Delta Tau Delta: the first new Indiana chapter since 1907. The honored guest at the installation was the Honorable Thomas C. Clark, National President of Delta Tau Delta, Associate Justice of the United States Supreme Court, and former United States Attorney General. Mr. Clark came personally to present the Charter of Epsilon Mu to the new chapter. Also in attendance were three National Past Presidents of Delta Tau Delta: Arnold Berg, Francis M. Hughes, and Norman Macleod. Distinguished representatives from Ball State University included President John R. Emens and many members of the administration and faculty. Members from various campus fraternities and sororities came to congratulate the newest Ball State Greeks. The installation was held in the Forum Room of the Ball State L.A. Pittenger Student Center with all inductees in formal wear. (Tom Seffrin, Dan Hockney, and Dennis Hockney pictured at left in formal wear). 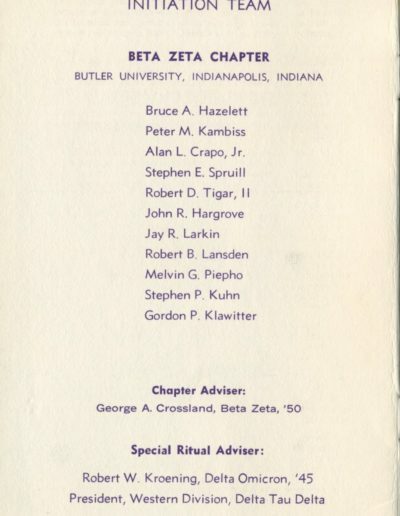 Conducting the ceremonies was a team headed by Bruce Hazlett, President of Beta Zeta Chapter at Butler University. A reception followed the installation which was held in the Gallery and West Lounge of the Arts Building. In the Gallery, Delt actives and alumni socialized and were served refreshments. It was at this reception that the first Delt Sweetheart, Terri Brookshire, was presented with a dozen red roses. 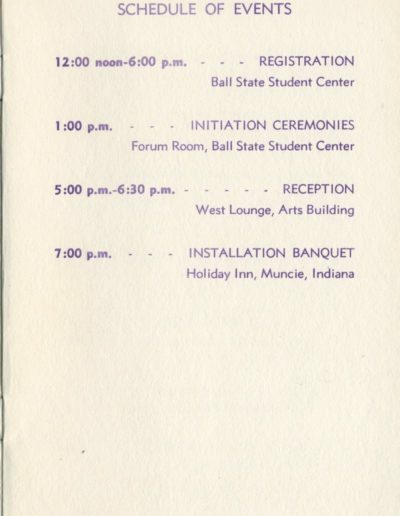 A banquet was held at the end of the day at the Muncie Holiday Inn. Following the dinner, President Emens welcomed Delta Tau Delta to the University. President Emens was followed by Justice Clark who presented the Epsilon Mu Charter to Chapter President Jim Nelson. 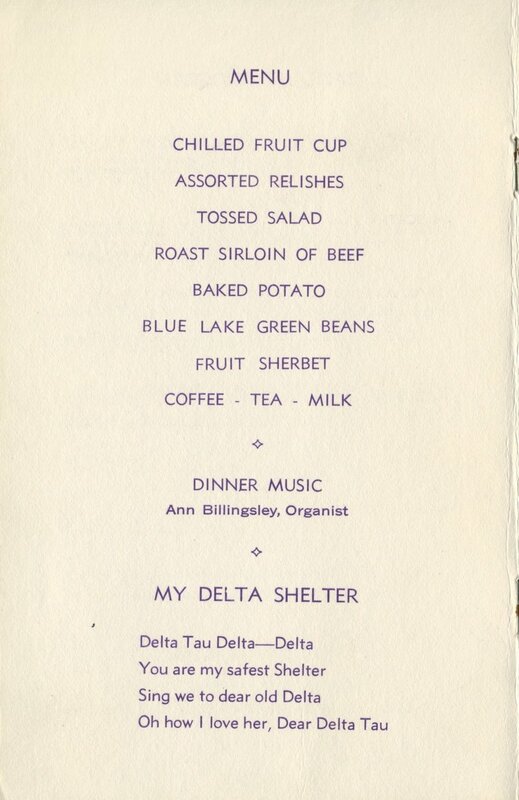 The traditional closing for Delt functions found all joining in the singing of the “Delta Shelter” after which many stayed for an informal champagne toast to the new Epsilon Mu Chapter of Delta Tau Delta. Later in the year, the first elected officers of Epsilon Mu took office. They were Rick Hawthorne (Ft. Wayne), President; Tom Borshoff (Indianapolis), Vice President; Tom Worden (Valparaiso), Secretary; and Joe Erne, Treasurer. 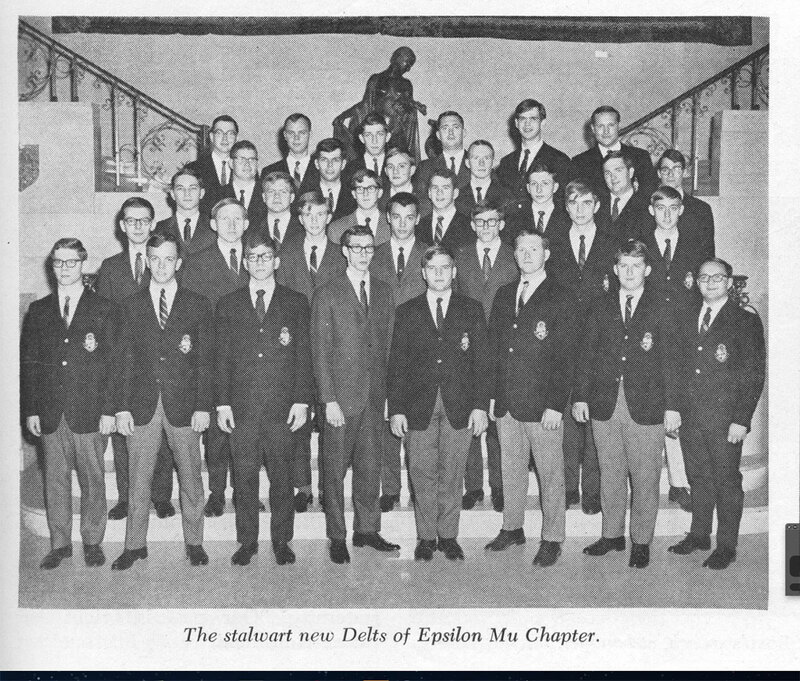 The marriages of several chapter members during the summer of 1967 were good reasons for the men of Epsilon Mu to get together. At these events, the members were confident that the purchase of a house was near. The Epsilon Mu House Corporation was formed and all indications were that the Corporation was in discussion to purchase a house. In early 1967, it was announced that an agreement was reached for the purchase of the Darrell Parson residence. The announcement came from John Fisher. Possession of the Shelter, located at 1201 W. Riverside Drive, took place on January 1, 1968 and occupancy on January 15, 1968. Fisher later spearheaded the fundraising campaign for the major east wing addition to the Riverside Drive Shelter. Today, even after his passing at age 93 in 2009, he continues to give. Mr. Fisher has provided generous funds and scholarships which will serve the EM Chapter for many future years. His life is a testament to the value of fraternal brotherhood. The house, a rambling three-story brick structure, was the only residence on Riverside Drive situated on a full city block of property. The acquisition of the Delt Shelter brought the men a place to live and come together as brothers. In the words of one of the eight Delta Tau Delta Alpha Chapter founders, John C. Johnson, The past salutes the present and joins it in the hope for the future. The men of Epsilon Mu have lived up to this statement and aspire to its motto: Our past is bright; our future is brilliant. In the mortar and brick of a new Riverside Shelter there is evidence of the brotherhood that began with the close friendship of a few men who met in a small, cramped, fourth-floor, smoked-filled attic storage room in historic Elliott Hall. The Shelter represents a material possession that exemplifies the willingness of the men living within to work together for a common goal. It is a testament to the countless future members of Epsilon Mu who will find true brotherhood within its doors. 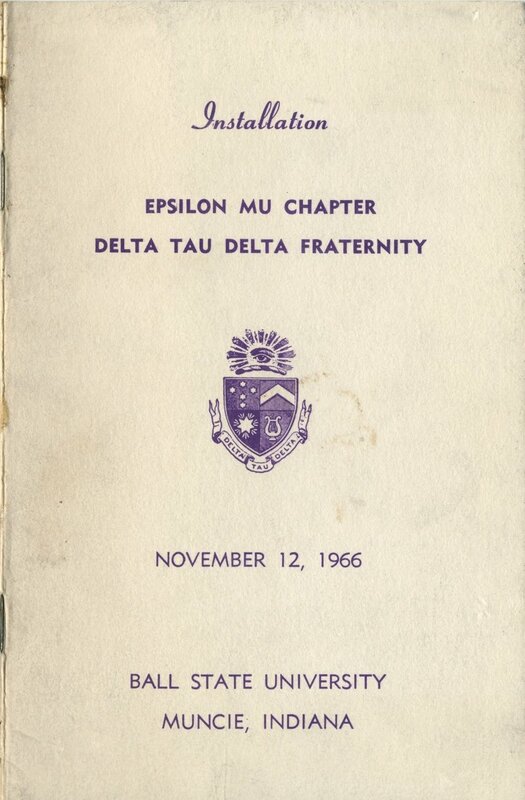 The early History of Delta Tau Delta Epsilon Mu was reviewed in October 2011 shortly after the 45th Epsilon Mu reunion by charter members of Goovna, Fratry, Pi Delta Gamma, and Delta Tau Delta Epsilon Mu. These men believed the history needed to be written by those who were “primary sources” – those who lived the history. 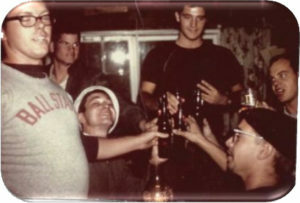 Thus, past officers of Goovna, Fratry, Pi Delta Gamma, and Delta Tau Delta Epsilon Mu spent time to pen an accurate (first hand) history of the transformation of the loosely organized Goovnas into the more tightly organized Pi Delta Gamma, and finally the well-established Delta Tau Delta Epsilon Mu International Fraternity.